AU - Lee, Myeong Ji. AB - 본 연구는 실제 불화수소 누출 사고에 대한 OCA(Off-site consequence analysis) 분석을 통해 최악 및 대안의 사고시나리오를 선정하여 사고영향범위 예측치를 평가하고, 사고 반경 내 농작물의 잔류오염도를 측정함으로써 화학사고로부터 발생될 수 있는 환경 피해영향범위를 도출하고자 하였다. KORA 소프트웨어를 이용하여 사고영향범위를 분석한 결과, 최악의 사고시나리오는 사고 발생지점으로부터 10 km 이상, 대안의 사고시나리오는 1,968 m의 영향범위가 산정되었고, ALOHA 소프트웨어 구동 결과는 약 1.9 km를 나타내었다. 아울러, 실제 사고 지역 내 농작물의 불소화물 잔류 여부를 측정한 결과, 피해지역 내 불소화물 농도는 4.96~276.82 mg/kg 범위로 사고 발생지점 인근이(E-1) 가장 높았고(276.82 mg/kg), 동쪽방향으로 멀어질수록 잔류농도가 감소하는 경향이었다. 한편, 북동 방향 2지점과 남동 방향 4지점은 사고 발생지점 인근보다는 낮은 경향이었다(4.96~28.98 mg/kg). 이러한 결과를 비추어 2 km 내외 지점의 불소화물 농도가 5 mg/kg 이하의 미미한 수준과 대안의 사고시나리오 예측 영향범위인 약 1.9 km를 고려했을 때 피해영향범위는 약 2 km 내외 수준인 것으로 추정된다. 이와 같이 OCA 평가는 누출조건, 기상조건, 시간경과에 따른 물리화학적 변수 등을 사고현장과 동일하게 입력할 수 없기 때문에 실제 피해영향범위와 다른 경향은 있지만 농작물 중 불소화물 잔류오염 여부를 동시에 평가함에 따라 화학사고로부터 화학물질의 확산범위를 산정하는데 있어 도움이 될 수 있을 것으로 판단된다.BACKGROUND:Hydrogen fluoride is one of the 97 accident preparedness substances regulated by the Ministry of Environment (Republic of Korea) and chemical accidents should be managed centrally due to continual occurrence. Especially, hydrogen fluoride has a characteristic of rapid diffusion and very toxic when leaking into the environment. Therefore, it is important to predict the impact range quickly and to evaluate the residual contamination immediately to minimize the human and environmental damages.METHODS AND RESULTS:In order to estimate the accident impact range, the off-site consequence analysis (OCA) was performed to the worst and alternative scenarios. 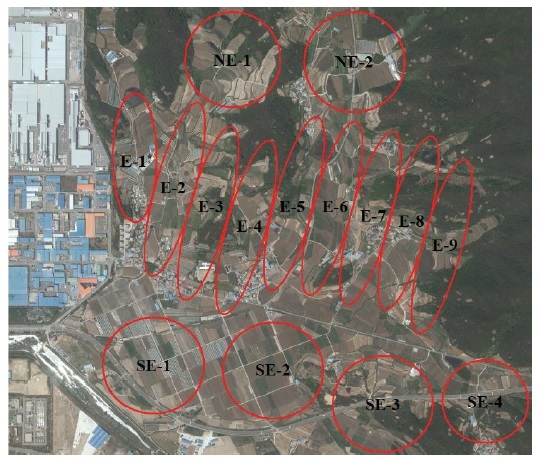 Also, in order to evaluate the residual contamination of hydrogen fluoride in crop, the samples in accident site were collected from 15-divided regions (East direction from accident sites based on the main wind direction), and the concentration was measured by fluoride (F-) ion-selective electrode potentiometer (ISE). As a result of the OCA, the affected distance by the worst scenario was estimated to be >10 km from the accident site and the range by the alternative scenario was estimated to be about 1.9 km. The residual contamination of hydrogen fluoride was highest in the samples near the site of the accident (E-1, 276.82 mg/kg) and tended to decrease as it moved eastward. Meanwhile, the concentrations from SE and NE (4.96~28.98 mg/kg) tended to be lower than the samples near the accident site. As a result, the concentration of hydrogen fluoride was reduced to a low concentration within 2 km from the accident site (<5 mg/kg), and the actual damage range was estimated to be around 2.2 km. Therefore, it is suggested that the results are similar to those of alternative accident scenarios calculated by OCA (about 1.9 km).CONCLUSION:It is difficult to estimate the chemical accident-affecting range/region by the OCA evaluation, because it is not possible to input all physicochemical parameters. However simultaneous measurement of the residual contamination in the environment will be very helpful in determining the diffusion range of actual chemical accident. Kim, J. Y., Lee, E., & Lee, M. J. (2019). Environmental Damage to Nearby Crops by Hydrogen Fluoride Accident. Korean Journal of Environmental Agriculture, 38(1), 54-60. Kim, Jae-Young, Eunbyul Lee, and Myeong Ji Lee. “Environmental Damage to Nearby Crops by Hydrogen Fluoride Accident.” Korean Journal of Environmental Agriculture 38.1 (2019): 54-60. 1. Kim JY, Lee E, Lee MJ. Environmental Damage to Nearby Crops by Hydrogen Fluoride Accident. Korean Journal of Environmental Agriculture [Internet]. 2019;38(1): 54-60. Available from: doi:10.5338/KJEA.2019.38.1.2. Kim, Jae-Young, Eunbyul Lee and Myeong Ji Lee. “Environmental Damage to Nearby Crops by Hydrogen Fluoride Accident.” Korean Journal of Environmental Agriculture 38, no.1 (2019): 54-60. doi: 10.5338/KJEA.2019.38.1.2. Hydrogen fluoride is one of the 97 accident preparedness substances regulated by the Ministry of Environment (Republic of Korea) and chemical accidents should be managed centrally due to continual occurrence. Especially, hydrogen fluoride has a characteristic of rapid diffusion and very toxic when leaking into the environment. Therefore, it is important to predict the impact range quickly and to evaluate the residual contamination immediately to minimize the human and environmental damages. In order to estimate the accident impact range, the off-site consequence analysis (OCA) was performed to the worst and alternative scenarios. Also, in order to evaluate the residual contamination of hydrogen fluoride in crop, the samples in accident site were collected from 15-divided regions (East direction from accident sites based on the main wind direction), and the concentration was measured by fluoride (F-) ion-selective electrode potentiometer (ISE). As a result of the OCA, the affected distance by the worst scenario was estimated to be >10 km from the accident site and the range by the alternative scenario was estimated to be about 1.9 km. The residual contamination of hydrogen fluoride was highest in the samples near the site of the accident (E-1, 276.82 mg/kg) and tended to decrease as it moved eastward. Meanwhile, the concentrations from SE and NE (4.96~28.98 mg/kg) tended to be lower than the samples near the accident site. As a result, the concentration of hydrogen fluoride was reduced to a low concentration within 2 km from the accident site (<5 mg/kg), and the actual damage range was estimated to be around 2.2 km. Therefore, it is suggested that the results are similar to those of alternative accident scenarios calculated by OCA (about 1.9 km). It is difficult to estimate the chemical accident-affecting range/region by the OCA evaluation, because it is not possible to input all physicochemical parameters. However simultaneous measurement of the residual contamination in the environment will be very helpful in determining the diffusion range of actual chemical accident. 화학물질은 정부차원에서 유해화학물질, 사고대비물질, 유해⋅위험물질, 독성가스, 위험물의 유형별로 관리되고 있지만 취급시설 노후화, 취급부주의 등의 문제로 화학사고가 빈번하게 발생되고 있다(Kim et al., 2018). 특히, 사고대비물질은 급성독성/폭발성이 강하여 화학사고의 발생 가능성이 높거나 화학사고 발생한 경우에 그 피해규모가 클 것으로 우려되는 물질로서 화학사고 대비/대응계획이 필요하다고 인정되는 97종의 물질을 환경부가 지정하여 관리하고 있다(Ministry of Environment, 2018). 이 중 불산은 2012년 구미 누출사고, 2013년 반도체 사업장 누출사고, 2014년 및 2016년에 금산 누출사고가 지속적으로 발생되어 중점적으로 관리되어야 하는 화학사고 다발물질 중 하나이다(National Institute of Chemical Safety, 2019; Kim and Jung, 2016). 특히, 2012년 구미 누출사고 당시 액상의 무수불산이 대기에 누출되면서 기상의 불화수소 가스가 빠르게 확산되어 1만 여명의 인명피해 뿐 아니라 농작물, 가축, 차량 등의 막대한 피해를 초래하는 계기가 되었다. 액체 성상을 가진 불산은 19.5℃ 이상에서 불화수소로 기화하여 대기 중으로 누출되면 빠르게 확산되는 특성을 가지며, 물에 잘 녹고 공기 중의 수분과 반응하여 흰색의 흄을 발생시키기 때문에 사고지역 주변에 심각한 환경피해를 초래한다(Gu et al., 2013; Koh et al., 2014). 또한, 부식성이 강하기 때문에 인체에 노출될 경우, 화상, 호흡기 자극, 기관지 궤양, 폐부종, 눈 자극 등을 일으킬 수 있으며(Koh et al., 2014), 만성적으로는 불소 침착증을 일으키는 등의 인체에 매우 유해하고(Erdal and Buchanan, 2005), 뼛속까지 침투하여 신체를 절단할 수 있는 굉장히 유독한 물질이다(Kim and Jung, 2016). 이처럼 불화수소는 인체와 환경에 매우 유해한 사고대비물질 중 하나이기 때문에 화학사고가 발생하면 신속하게 피해영향범위를 예측하고, 오염도를 즉시 평가하는 것이 무엇보다도 중요하다. 불산 및 불화수소 노출에 따른 화학사고 피해영향 조사 연구는 여러 연구자들에 의해 활발히 진행되고 있는데, 구미 불산 누출사고 주변 불소화합물 및 불화수소 농도 추정 연구(Gu et al., 2013), 구미 불산 누출사고로 인한 주변지역 환경영향권 설정 연구(Koh et al., 2014), 불화수소 누출 사고 피해범위 예측 및 모델링 활용 연구(Kim and Jung, 2016), 농작물 및 수목에 대한 불화수소 오염특성 연구(Kim et al., 2016), 구미 불산사고 사례연구 예측모델 피해영향범위 비교 연구(Kim et al., 2017) 등이 대표적이다. 하지만 사고피해범위 예측과 오염도 확인에 대한 각각의 개별 연구에 국한하고 있어 사고 유형에 따른 예측 피해범위와 실제 오염된 환경인자의 상관성 연구는 극히 드문 실정이다. 또한, 불화수소 가스는 빠르게 확산되는 특성으로 인해 실제 환경인자의 피해영향범위 평가가 매우 어렵기 때문에 이를 뒷받침할 수 있는 과학적 근거와 판단기준을 검토하기 위한 연구가 필요한 실정이다. 따라서 본 연구는 실제 발생된 불화수소 누출 사고 사례를 배경으로 사고유형에 따른 사고시나리오를 선정하여 사고영향범위 예측치를 평가한 후, 사고 반경 내 농작물을 채취하여 불화수소로 인해 피해를 받은 농작물의 잔류오염도를 측정함으로써 화학사고로부터 발생될 수 있는 환경 피해영향범위 산정의 기초자료로 활용하고자 수행되었다. 본 연구는 유수불산 제조를 위해 희석설비에 공급되는 무수불산을 취급하는 사업장에서 18톤이 적재된 탱크로리의 불산을 희석설비로 이송하는 과정에서 작업자의 실수로 밸브가 열려 불화수소가 누출된 사고를 배경으로 수행되었다. 사고 당시 풍향은 서풍으로 1.6 m/s의 안정된 기상상태를 보였으며, 대기기온은 21.8℃, 상대습도는 약 64%이었다(Kim et al., 2017). 아울러, 사고발생 시설(탱크로리 입출하 시설) 기준으로 동쪽 방향 바로 측면에는 사업장 경계가 있고 그 경계 밖에 쌀, 고추 등을 경작하고 있어 농작물에 직접적인 영향을 주어 갈변 및 고사가 되는 피해가 발생된 불산 누출 화학사고 사례를 배경으로 하였다. 본 사례연구를 바탕으로 화학물질안전원의 사고시나리오 선정에 관한 기술지침(National Institute of Chemical Safety, 2018) 및 사고 영향범위 산정에 관한 기술지침(National Institute of Chemical Safety, 2015)에 따라 최악 및 대안의 사고시나리오를 선정하여, 사고 영향범위를 예측 평가하였다. 평가 프로그램은 대한민국 환경부에서 배포한 KORA 소프트웨어(Korea Off-site Risk Assessment Supporting Tool)와 미국 환경보호청에서 배포한 ALOHA 소프트웨어(Areal Location of Hazardous Atmospheres)를 이용하였으며, 평가대상은 무수불산이 적재된 18톤 탱크로리에서 희석탱크로 이송하는 공정으로, 취급물질의 기본정보(Table 1)와 시나리오 구간인 탱크로리 설비의 운전정보(Table 2)를 고려하여 평가하였다. 사고시나리오의 선정은 최악 및 대안의 사고시나리오로 구분하는데, 최악의 사고시나리오는 설비의 최대량이 누출되어 사람 및 환경에 미치는 영향범위가 최대인 경우를 말하고, 대안의 사고시나리오는 최악의 사고시나리오보다 현실적으로 발생 가능성이 높고 사람이나 환경에 미치는 영향이 최대인 사고시나리오를 말한다. 따라서 끝점농도, 기상조건, 지표면 상태, 누출온도, 누출량, 누출시간 등을 각 시나리오별로 평가조건을 달리하여 분석하였다(Table 3). 즉, 모든 시나리오는 무수불산 희석설비 연결 배관에서 독성 물질이 누출되어 확산되는 경우로서 끝점 기준을 ERPG-2 값인 20 ppm으로 적용하였으며, 기상조건은 최악의 시나리오는 풍속 1.5 m/s, 대기안정도 F, 온도 25℃, 습도 50%를 적용하고, 대안의 시나리오는 사고당시 기상조건인 풍속 1.6 m/s, 대기안정도 D, 온도 21.8℃, 습도 64%를 적용하였다. 지표면의 굴곡도는 시골지형으로 하였으며, 누출량 산정은 최악의 사고시나리오의 경우 탱크로리 내 취급하는 무수불산의 최대량이 10분 동안 전량 방출되어 확산되는 것으로 가정하였고, 대안의 사고시나리오는 누출량 산정을 위해 누출공 크기는 가장 큰 연결 배관직경 50 mm로 가정하였고, 누출시간은 미국석유화학협회의 위험기반검사 기준(API 581)에 따른 산출방법에 따라 검출시스템과 차단시스템을 고려하여 30분으로 산정하였다. 또한, 사고 영향범위 산정에 관한 기술지침(National Institute of Chemical Safety, 2015)에 따라 가우시안 플룸 모델을 사용하여 영향범위를 산정하였다. 불화수소 가스의 피해영향을 실험실 내에서 가시적으로 확인하기 위해 피해를 입은 대표 농작물인 고추를 일반 대형마트에서 구입하여 불산 용액을 노출시킨 후 가시적인 피해 양상 실험을 수행하였다. 즉, 일정량의 고추를 10 L 밀폐형 용기에 넣고, 48% 불산용액 10 mL를 주입한 후, 노출 시간별로 시료 상태를 확인하고, 노출 전 후 시료의 불화수소 농도를 측정하였다. 사고지점 반경 내 대표 농작물인 벼를 지점별로 각 5점씩 채취하였으며, 사고당시 주 풍향인 서풍을 고려하여 약 200 m 간격을 두고 동쪽 방향으로 9개 지점을 선정하여 시료를 채취하고, 9개 지점 외의 주변 지역 피해여부를 확인하기 위해 남동 방향 4개 지점 및 북동 방향 2개 지점을 선정하여 총 15 개 지점 75점 시료를 채취하였으며, 대조군으로 비오염 지역에서 생산된 벼를 채취하여 시료로 사용하였다(Fig. 1). 불산 표준품(≥99%)은 Sigma-Aldrich (USA)로부터 구입하여 사용하였다. 불소이온 선택성 전극법 전처리에 사용된 시약으로 TISAB Ⅱ (Total ion strength adjustment buffer Ⅱ) 용액(Thermo Scientific, USA), 3 M KCl은 Thermo Scientific(USA)로부터 구입하여 사용하였다. 표준원액은 불화나트륨(Sigma-Aldrich, USA)을 105℃에서 4시간 가열하고 데시케이터 안에서 식힌 다음 약 221.0 mg을 칭량하여 TISAB Ⅱ 용액에 녹였으며, 이를 1000 mg/L 표준원액으로 조제하였다. 표준용액은 표준원액 적당량을 취하고 TISAB Ⅱ 용액으로 일정량 희석한 후 사용하였다. 표준원액과 표준용액은 모두 갈색병에 담아 4℃ 냉장실에 보관하면서 사용하였다. 균질화한 시료 1 g을 정밀히 달아 50 mL 튜브에 넣고, TISAB Ⅱ 용액을 첨가하여 20 mL로 정용하였으며, 이때 희석배율은 약 20배로 하였고, 부유물이 많은 시료의 경우에는 필요에 따라 시료의 양을 줄여 측정하였다. 불소이온의 측정은 불소이온 선택성 전극 및 온도 보정 전극이 장착된 Electrode Potentiometer (Thermo Scientific, USA)를 사용하였다. 측정에 앞서 불소이온 선택성 전극과 온도 보정 전극을 시험용액에 넣고 일정한 속도로 교반하면서 측정값의 경시 변화를 관찰하여 전위 값이 안정화된 상태를 최적 조건으로 설정하였다. 검량선의 작성은 표준용액을 농도별로 일정량 취한 후 상기 측정법으로 전위 값을 구하여 불소농도의 상용대수(Log) 값으로 작성하였다. 이때 감응 기울기가 -54~-60 mV 범위내에 들어오도록 하였다. 측정된 결과는 검량선에 대입하여 불소농도를 얻고 그 결과 값에 불화수소 보정계수를 곱한 후 최종 불소화물 농도를 산출하였다. 통계분석은 SPSS ver. 25 (SPSS Inc., Chicago, Illinois, USA) 소프트웨어를 이용하여 측정하였다. 즉, 데이터 간의 유의차는 One way ANOVA의 Duncan’s multiple range test를 통해 p<0.05 수준에서 검증하였다. 실제 화학사고 사례를 바탕으로 무수불산이 적재된 탱크로리에서 희석탱크로 이송하는 공정을 시나리오 구간을 설정하여 KORA 프로그램으로 사고영향범위를 평가한 결과는 Fig. 2와 같다. 사고시나리오 선정에 관한 기술지침에 따르면 사고영향범위 평가는 최악의 사고시나리오와 대안의 사고시나리오로 구분되어 결정되는데, 본 연구에 적용된 방법은 최악의 사고시나리오의 경우 탱크로리 또는 이송하는 배관 등에서 10분 동안 전량이 누출되어 그 피해가 최대인 경우로 산정하였고, 대안의 사고시나리오는 실제 사고 현장의 이화학적 변수, 기상조건 등을 반영하여 사업장 외부로 영향을 미치는 범위로서 현실적으로 발생 가능성이 높은 시나리오로 선정되었다. 사고 영향범위 평가 결과, 최악의 사고시나리오의 경우 사고영향범위가 프로그램 산출 최대치인 사고 발생지점으로부터 10 km 이상 반경이 피해예측범위로 산정되었고, 대안의 사고시나리오는 사고 발생지점으로부터 1,968 m의 사고영향범위가 산정되었다. 이러한 결과는 본 연구와 동일한 사고를 배경으로하여 ALOHA 프로그램을 이용해 사고영향범위를 예측한 Kim과 Jung 등(2016)의 결과와 유사하였는데, 탱크에서 직접 누출이 일어나는 최악의 사고시나리오는 최대치인 10 km, 연결된 배관(밸브) 일부분이 파손된 대안의 사고시나리오는 1.8 km라고 보고한 바 있다. 한편 본 연구에 적용한 KORA 프로그램은 사업장의 공정정보에 준하여 예측 시나리오를 구동할 수 있지만, 실제 사고 사례의 누출량을 입력할 수 없는 단점이 존재하기 때문에 direct source model 방법을 이용해 실제 누출량을 대입할 수 있는 ALOHA 프로그램을 이용하여 사고영향범위를 추가적으로 도출하였다. 실제 사고는 무수불산이 18톤 적재된 탱크로리에서 희석설비로 이송하는 과정 중 밸브가 열려 약 8~12톤이 누출 되었다고 보고된 바 있다(Gu et al., 2013; Kim et al., 2017). 따라서 불화수소가 30분간 누출되었다고 보고, 누출률 4.59 kg/s 구동조건을 대입하여 약 8톤이 누출된 것으로 가정하여 사고영향범위를 산정한 결과, 약 1.9 km의 피해반경이 확인되었으며(Table 4), 이 결과는 KORA에서 도출된 영향범위와 유사한 결과이었다. 하지만 ALOHA 프로그램 역시 프로그램 구동 상 문제점이 존재하는데 가압된 액체 설비의 누출에 대한 시나리오가 제공되지 않기 때문에 실제 사고 영향평가를 모두 반영하지 못하는 것으로 판단된다. 이상과 같은 대안의 사고시나리오 영향범위는 본 연구의 사례와 동일한 사고를 배경으로 실시한 기존 연구자들의 결과와 다소 차이는 있었으나(Jung et al., 2016; Kim et al., 2017; Kim and Jung, 2016), 1 km~1.4 km의 범위로 본 연구에서 예측한 사고영향범위인 1.9 km 이내에 있었다. 하지만 본 연구와 기존 연구자들이 보고한 예측범위 결과는 ALOHA, KORA, HGSYSTEM, PHAST (Process Hazard Analysis Software), CARIS (Chemical Accident Response Information System) 등 다양한 소프트웨어에 의해 구동된 결과로서 모델링 방법, 시나리오 변수 입력 차이 등에 따라 달라질 수 있는 맹점이 있고, 사고현장에서 발생할 수 있는 기상조건 변화, 물리화학적으로 발생하는 다양한 변수들이 존재하기 때문에 대기 중 불화수소의 잔류여부라던가 식물체 등 오염시료의 잔류여부를 추가적으로 평가하여 예측 영향범위와 실제 확산 거리에 대한 비교 검토가 필요한 것으로 사료된다. 밀폐 용기에 불산 용액을 넣고 발생하는 불화수소 가스에 의해 영향을 받은 고추의 가시적 피해양상은 Fig. 3과 같다. 노출 전의 풋고추는 본래 색인 청록색을 띄다 노출 이후 1시간이 경과함에 따라 꼭지 부분부터 최초로 갈변하는 변화를 보이다 점차 고추 표면의 변화가 발생하면서 노출 16시간 이후에는 고추 전체가 갈변 또는 고사하는 현상이 확인되었다. 이와 같이 노출 이후 1시간이 경과되면서 고추의 가장자리인 꼭지에서 최초 갈변이 발생하였는데, 이는 불산 용액이 기화되면서 발생한 불화수소 가스가 불소화물 형태로 조직에 흡수되어 식물 내 수액에 용해됨에 따라 증산류를 통해 이동되는데, 최종적으로 식물 조직의 끝과 가장자리에 불소화물이 축적되어 식물 괴사 현상이 발생한다고 알려져 있기 때문으로 판단된다(Koh et al., 2014). 이에 점차 흡수율은 빨라져 노출 16시간 이후 관찰되는 것과 같이 고추의 전체에 불소화물이 축적되어 갈변과 괴사현상이 두드러지게 나타난 것으로 확인된다. 아울러, 사고 당시 현장의 농작물은 갈변 및 고사 피해가 즉시 나타난 것으로 알려져 있는데, 이는 누출된 무수불산의 순도가 거의 100% 수준이고 불화수소 가스 형태로 누출되어 풍향에 따라 급속히 확산되었기 때문에 단시간 내 인근 지역에 직접적인 피해를 준 것으로 판단된다. Gu 등(2013)은 동일한 사고 지역 내 농작물의 가시적 피해를 확인 한 결과, 멜론 잎, 콩잎, 깻잎 등이 불화수소에 노출되어 잎 표면은 전체 혹은 부분적으로 고사되었고, 무 잎, 전나무 잎 등은 잎 조직의 끝과 가장자리에 불소화물이 축적되어 점차 고사되는 형태를 확인한 바 있다. 또한, 유사한 사고 지역 인근의 작물 피해 현황에서도 볼 수 있는데, 불산 누출로 5~20 m 이격된 지점에 채취한 콩과 덩굴식물 잎, 산딸기 잎 및 칡덩굴 잎과 노출되지 않은 깻잎, 칡덩굴 잎을 비교한 결과 확연하게 갈변 및 고사 차이가 확인되었으며(Yim and Kim, 2016), 불산 누출 지역 주변의 잣나무, 장구밥나무, 상수리나무가 작물 잎의 조직 끝과 가장자리에 고사 현상이 일어난 결과에서도 불산 누출로 인한 농작물의 피해 정도를 확인할 수 있었다(Kim et al., 2015). 한편, Park 등(2017)은 사염화규소와 염산을 식물 잎에 노출 시킨 결과, 염화수소 가스 발생으로 고춧잎과 옥수수 잎 체내에 흡수되어 유기물질 산화로 인해 세포 사멸이 일어나고, 기공으로 흡수되어 엽록소가 파괴됨에 따라 잎의 가장자리부터 황갈색 또는 회백색으로 고사한 현상을 비추어본 바 본 연구에서 수행한 불산 노출실험 역시 불화수소 가스가 발생하여 식물 체내에 흡수되고, 세포사멸, 엽록소 파괴, 증류현상 등에 의해 황갈색의 갈변 또는 고사 현상이 일어난 것으로 추정된다. 사고 지역 내 농작물의 피해여부와 실제 노출지역의 확산거리를 확인하기 위해 사고 당시 주 풍향인 서풍을 기준으로 동쪽방향 9개 지점(E-1~E-9)과 북동 방향 2개 지점(NE-1~NE-2) 및 남서 방향 4개 지점(SE-1~SE-4)에서 채취한 농작물의 불소화물 측정값의 결과는 Table 5와 같다. 오염되지 않은 농작물(벼) 시료는 모두 불검출 결과를 보인 반면에 사고 지역 내 농작물 시료는 4.96~276.82 mg/kg 범위를 나타내어 사고 주변지역의 환경피해가 발생되었음을 확인할 수 있었다. 특히, 사고 발생지점 인근 시료(E-1)가 276.82 mg/kg를 나타내어 가장 높았고, 서풍의 영향으로 동쪽 지역의 농작물의 불소화물 잔류농도가 높았지만 사고 발생지점에서 동쪽방향으로 멀어질수록 잔류농도는 점차 감소하는 경향이었다(p<0.05). 한편 누출된 무수불산은 누출 즉시 기화되어 대기 중에 퍼지는 확산 속도는 상당히 빨랐으며, 사고 당일 풍향은 시간이 경과함에 따라 북서풍 → 동풍 → 서풍 → 남서풍으로 주기적인 변화를 나타내었는데(Korea Environment Institute, 2013), 이는 불화수소에 의한 환경피해가 동쪽에 국한되지 않고, 인근 주변지역의 사방에 불화수소 가스에 의한 피해영향이 발생되었을 것으로 추정되었다. 이에 사고지점으로부터 북동 방향 2지점과 남동 방향 4지점의 시료를 채취하여 불소화물을 측정한 결과, 사고 발생지점 인근보다는 낮은 경향이었지만, 4.96~28.98 mg/kg으로 사고 발생지점으로부터 1 km~1.8 km 거리를 두었던 E-6~E-9 군의 불소화물 오염 범위에 있는 것으로 확인되었다. 이러한 결과는 사고 전역에 불화수소가 확산되어 피해를 미친 것으로 판단되는데, 불산이 19.5℃ 이상에서 불화수소로 기화되면서 대기 중의 수증기를 만나 불소화물 형태로 전환되고, 12시간~50시간동안 대기 중 잔류하여 이후 지표면으로 낙하할 수 있기 때문인 것으로 추정된다(Koh et al., 2014). 앞서 대안의 사고시나리오에 의해 추정된 사고영향범위 결과(Fig. 2)와 시료의 잔류 오염 측정 결과에 따라 추정된 피해영향범위를 비교한 결과, 농작물에 잔류하는 불소화물 농 도가 2 km를 넘어서도 확인되었지만, 인근 불소화물 농도가 5 mg/kg 이하 수준으로 생태계 내 식물의 불소화물 농도가 20 mg/kg 이하 수준으로 보고된 내용(Koh et al., 2014)과 사고발생지점보다 약 56배 감소한 결과를 보았을 때 피해영향범위는 2.2 km 내외 수준인 것으로 판단되었다. 따라서 대안의 사고시나리오의 피해영향범위 결과 약 1.9 km와 미미한 차이를 보이지만 유사한 경향임을 확인할 수 있었다. Kim 등(2017)은 동일한 사고를 배경으로 HGSYSTEM 프로그램을 이용하여 피해영향범위를 추정한 결과 약 1 km 내외, ALOHA 프로그램은 약 1.9 km의 영향범위를 보였다고 보고한 바 있으며, 사고당시 CARIS 구동 결과가 약 1.4 km을 가정했을 때, ALOHA를 제외한 유사 프로그램들의 추정 피해영향범위는 본 연구의 결과보다 낮은 경향이었다. 이는 사고당시 불화수소의 누출량, 누출조건, 기상조건, 시간경과에 따른 물리화학적 변수 등을 동일하게 입력할 수 없기 때문에 구동 소프트웨어 간 피해영향범위의 차이가 발생되었을 것으로 추정된다. 하지만 농작물 중 불소화물 잔류오염 정도에 따른 피해영향범위와 유사한 수준으로 결과가 도출된 점을 보았을 때 불산 및 불화수소 사고에 따른 피해거리를 산정하는데 기초자료로 참고할 수 있을 것으로 기대되며, 본 연구와 같은 화학사고 사례연구가 지속적으로 수행되어 실제 화학사고 현장에서 활용이 가능하도록 피해영향범위를 판단하는 기준을 마련하는 후속연구가 진행되어야 할 것으로 판단된다. Crop sampling sites in chemical accident area. *E-1~E9: The east direction from accident site, NE-1~NE2: The north-eastern direction from accident site, SE-1~SE4: The south-eastern direction from accident site. Results of off-site consequence analysis (OCA) using KORA software (Korea off-site risk assessment supporting tool). Visible changes of before and after hydrogen fluoride exposure on pepper. *Means with the same letter superscript in a column are not significantly different by Duncan’s multiple range test (p<0.05). 1. Erdal, S., & Buchanan,S. N. ((2005)). A quantitative look at fluorosis, fluoride exposure, and intake in children using a health risk assessment approach.. Environmental Health Perspectives 113. 111 - 117. 2. Gu, S., Choi, I., Kim, W., Sun, O., Kim, S., & Lee,Y. ((2013)). Study on the distribution of fluorides in plants and the estimation of ambient concentration of hydrogen fluoride around the area of the accidental release of hydrogen fluoride in Gumi.. Korean Journal of Environmental Health Sciences 39. 346 - 353. 3. Jung, B. G., & Lee,C. J. ((2016)). Consequence analysis based research for the initial response of chemical accidents.. Korean Journal of Hazardous Materials 4. 22 - 29. 4. Kim, G. S., An, J. H., Lim, C. H., Lim, Y. K., Jung, S. H., & Lee,C. S. ((2015)). Diagnostic assessment on vegetation damage due to hydrofluoric gas leak accident and restoration planning to mitigate the damage in a forest ecosystem around hube globe in Gumi.. Journal of Wetlands Research 17. 45 - 52. 5. Kim, J. H., Jeong, C., Kang, S. M., Yong, J. W., Yoo, B., & Seo,J. M. ((2017)). Comparison study for impact range of prediction models through case study about Gumi hydrogen fluoride accident.. Korean Chemical Engineering Research 55. 48 - 53. 6. Kim, J., & Jung,S. ((2016)). 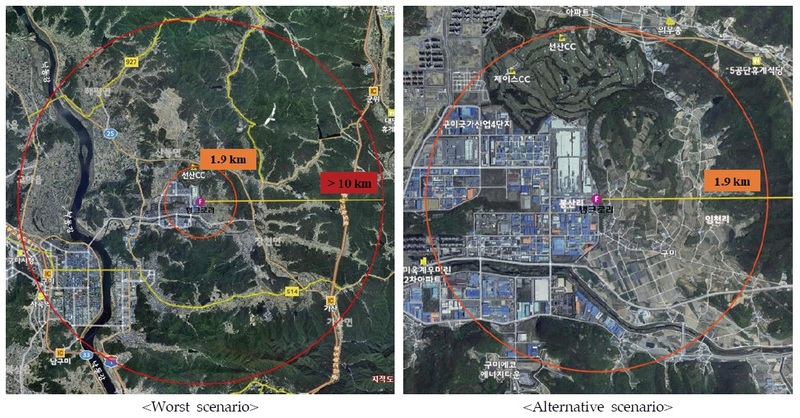 Offsite consequence modeling for evacuation distances against accidental hydrogen fluoride (HF) release scenarios.. Korean Chemical Engineering Research 54. 582 - 585. 7. Kim, J. Y., Lee, Y. H., Kim, M. S., Kim, H. J., Ryu, T. I., Jeong, J. H., Hwang, S. R., Kim, K., & Lee,J. H. ((2018)). Removal efficiency of ammonia and toluene using mobile scrubber.. Korean Journal of Environmental Agriculture 37. 49 - 56. 8. Kim, Y. J., Kang, Y. Y., Kim, W. I., Hwang, D. G., Jeong, M. J., Yeon, J. M., Shin, S. K., & Jeon,T. W. ((2016)). HF leak accident study of contamination characteristices at industrial field, focus on the crop and tree damage.. Journal of Korea Society of Waste Management 3. 666 - 673. 9. Koh, D., Kim, J., & Choi,K. ((2014)). Defining area of damage of 2012 hydrofluoric acid spill accident in Gumi, Korea.. Korean Journal of Environmental Health Sciences 40. 27 - 37. 10. Park, J. S., Kim, J. Y., Kim, M. O., Park, H. W., Chung, H. M., & Choi,J. W. ((2017)). Evaluation of exopsure indicators for plants by silicon tetrachloride release.. Korean Journal of Environmental Agriculture 36. 288 - 292. 11. Yim, B., & Kim,S. T. ((2016)). Estimation of the concentration of HF in the atmosphere using plant leaves exposed to HF in the site of the HF spill.. Journal of Korean Society for Atmospheric Environment 32. 248 - 255.